The original i30 was an important car for Hyundai. It replaced the fairly woeful Accent and was such a big step forward that it bought the brand­ to a whole new audience who would never had previously considered a Hyundai. That was just five years ago and already Hyundai has come up with a replacement. And impressively the new i30 takes another big leap forward, so much so in fact that this is now a serious alternative to the Ford Focus and even the Volkswagen Golf. The styling echoes the larger i40 with a near identical front end including a distinctive strip of LED daytime running lights. Overall it’s a very neatly designed hatchback that’s far more striking and memorable than the original i30. Crucially it has a much more premium appearance. This is certainly a world away from the ‘value’ image that Hyundai is usually associated with. And this continues inside. Again it’s similar to the i40 and the new Veloster with a really well laid out interior that’s comfortable and easy to get to grips with. All the cars we tested were top specification models so it’s difficult to tell what an entry-level model will be like, but the quality of the finish and the attention to detail are both top notch. If you’re used to Focus or an Astra you’d be very at home in the i30. As you’d expect from a Hyundai, it’s also well equipped. There are some impressive features as standard including an electric parking brake, Bluetooth, front fog lights, air conditioning, iPod and USB connections, heated electrically adjustable mirrors and a multifunction steering wheel. Hyundai isn’t shy when it comes to upmarket extras either with features such as a reversing camera, keyless entry and start plus a panoramic sunroof available as options. There’s plenty of room inside, particularly for the driver, while the seats are comfortable and supportive in all the right places. It’s just as good for those in the back and even six-footers will find plenty of headroom and more than reasonable knee room. Add in a large and easy to load boot which has 378 litres of space - that's 60 litres more than a Focus and 25 litres more than a Toyota Auris - and you have all the practicality you need in a hatch. So far so good then, but what is it like to drive? Well the answer is extremely competent. It’s not going to set your world on fire but it’s incredibly comfortable, refined and effortless to drive. It handles well with nicely responsive steering and plenty of front end grip plus it really excels on the motorway where it feels like a larger car, such is the absence of noise. The steering lacks feel but aside from that there is very little to find fault with. Interestingly all models (apart from entry-level Classic) come with a new Flex Steer system which has three modes - comfort, normal and sport. There's a button on the steering wheel to change them and each has differing levels of steering assistance and feedback. You do notice the difference, especially in sport where it's heavier and more responsive. But the normal mode is more than adequate that most people will rarely change. Five engines are available from launch with the entry-level model a 1.4-litre petrol with 100PS that's group 7 insurance. The other petrol is a 1.6-litre with 120PS that's only available in Active trim with an automatic gearbox. But most people are likely to go for a diesel i30. There are three available - a 1.4 CRDi with 90PS in the entry-level Classic plus two 1.6-litre engines. It's these larger diesels we tested. There's a 110PS model or a more powerful 128PS version but both give strong in-gear performance with 260Nm of torque. It’s not the quietest engine on start up and can get a little noisy when pushed hard, but in everyday driving it’s smooth and quiet. Sitting at 70mph on the motorway you barely notice it working. Economy is another strong point and something Hyundai has been working on. Both 1.6 CRDi manual engines are badged Blue Drive - Hyundai's fuel saving technology - which means they have Intelligent Stop and Go (ISG) which helps improve fuel economy to 76.3mpg in the 1.6 CRDi 110PS with emissions of just 97g/km, meaning zero VED. These figures are impressive considering this model still accelerates from 0-62mph in 11.5 seconds and is plenty fast enough in everyday driving. It certainly doesn't feel like a 'green' model when you're behind the wheel. It's helped by a nicely positive six-speed manual gearbox while there’s a new optional six-speed automatic which has smooth shifts and works surprisingly well with the 1.6-litre CRDi. Of course, as it’s a Hyundai the i30 comes with the Five Year Triple Care package which includes a five-year unlimited mileage warranty as standard. True, its sister car the new Kia Cee’d comes with a longer seven-year warranty which is limited to a fairly generous 100,000 miles, but Hyundai says it aims to maximise the value of its warranty by including roadside assistance for the five years along with free vehicle health checks. As before there will be an i30 Estate coming soon which will add more space and practicality to the already impressive package. Plus interestingly Hyundai says it is toying with the idea of introducing sportier versions of the both the i30 and i40, offering more performance and GTI-esque styling. This more than anything shows the confidence Hyundai has in the i30 and in its image in the UK. 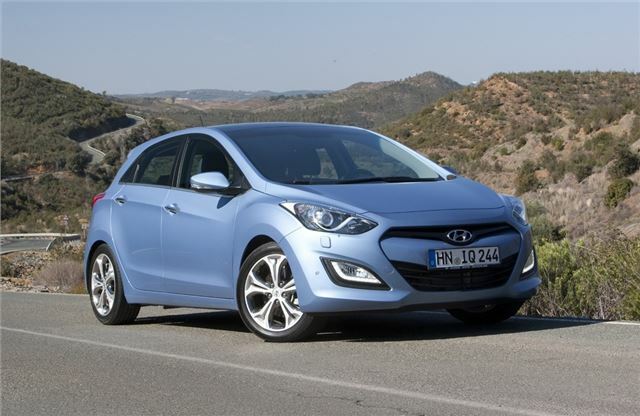 Hyundai has succeeded in producing a superb all rounder in the i30. It’s hugely capable, spacious and pleasant to drive, plus it feels well built and refined. Hyundai products have proved very reliable too so there should be few worries on that front and the new i30 went through 350,000 miles of testing. Add in competitive prices with the entry-level model costing £14,495 and the popular 1.6 CRDi Active priced at £17,995 and the i30 is a very attractive package. In more ways than one.